The US has called for a ceiling on some Cambodian garment exports following a dramatic surge in shirt and sweater ex­ports during the past year, government officials confirmed Thursday. Although many government officials called the decision routine, a garment industry representative said a quota would have serious repercussions on the in­dustry, one of Cambodia’s fastest growing sectors. And one Com­merce official suggested clothes fraudulently stated to be made in Cam­bodia may be partly behind the staggering increase in exports. The US government’s decision, which officials said was made last month, comes following the sharp rise of exports in three categories—cotton sweaters, and cotton knit shirts and blouses. 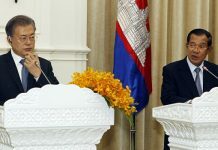 Rasmei Kampuchea newspaper this week cited a US government notice to the Cambodian Embas­sy in Washington saying the move was to protect the US’ do­mestic industry. US Embassy officials in Phnom Penh declined to comment. An economic adviser to the Council of Ministers, Te Doung Tara, said Cam­bodia’s exports had surpassed a 1 percent share of garment exports in these categories to the US, which triggered the call for a ceiling. Experts said the increase in garment exports has been substantial, jumping from nothing to “millions of dozens” in just a few years, but statistics were unavailable from the Commerce Minis­try on Thursday. A ministry official said cotton shirt exports were approximately 1.7 million dozen from mid-1997 to mid-1998. This is not the first time ex­ports have been limited. Last year, the US set a quota on cotton gloves manufactured in Cam­bodia, although it was unclear whether the quota was negotiated or imposed. Negotiations are scheduled for next month. Although several Commerce Ministry officials said Thursday that Commerce Minis­ter Cham Prasidh would lead a delegation to Washington, Te Doung Tara said it has yet to be decided who would lead a delegation and Cambodia may instead ask for talks in Phnom Penh. Following notification, if an agreement is not reached within 60 days, the US could impose a quota, which would probably be less favorable than a negotiated one, according to those familiar with the process. Government officials declined to discuss strategies for the negotiations or how quotas might be allocated, but one industry source said the US was suggesting a ceiling of 54,000 dozen sweaters and 1.74 million dozen shirts annually. 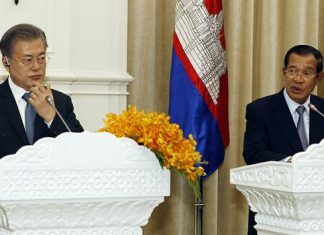 Until now, Cambodia’s unique position of an absence of quotas coupled with special trade privileges for the US, such as Most Favored Nation, has served as a magnet to foreign garment manufacturers and is the main reason for the sector’s phenomenal growth, analysts said. According to the Commerce Ministry, there are now about 150 factories operating in Cambodia and despite the economic slowdown, many of the investment applications continue to be for garment factories. 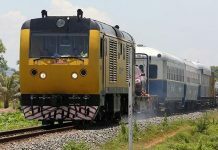 But Cambodia’s attractions also make it a popular location for companies who want to abuse these privileges through fraud. The Khmer-language press has alleged quotas are linked to the fraudulent use of government certificates attesting that garments were made in Cambodia, allowing manufacturers to take advantage of trade privileges. But Te Doung Tara denied the allegations and said the certificates are useless, because US customs inspectors use bills of lading and shipment itineraries to trace the origin of the garments. But a Commerce Ministry official, speaking on condition of anonymity, believes manufacturers in other countries may be falsely using “Made in Cam­bodia” labels and exporting their garments to the US. He did not know how widespread the practice is. Government officials have also fined companies for illegally importing partially finished products—sweaters, in particular—and completing them in Cam­bodia in order to take advantage of the absence of quotas. Although some government officials and analysts downplayed the effect quotas could have on the sector because they were limited to only three categories, Garment Manufacturers Assoc­iation of Cambodia Secretary-General Roger Tan said on Thurs­­day that it would “naturally” have an impact. For those who produce these items, he said, an imposed quota will be “a big headache,” and investors who had wanted to come and manufacture cotton sweaters and shirts will stay away, he said.